How can you provide stunning photos and graphics without compromising website or app performance? Six of Akamai’s foremost image experts teamed up with O’Reilly Media to answer that question. 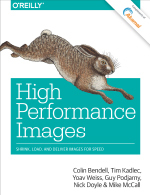 The result is High Performance Images, a book providing useful tips, tricks, and practical theory to help developers deliver powerful images on any website or app. For more on High Performance Images watch the video above, or download the e-book now.